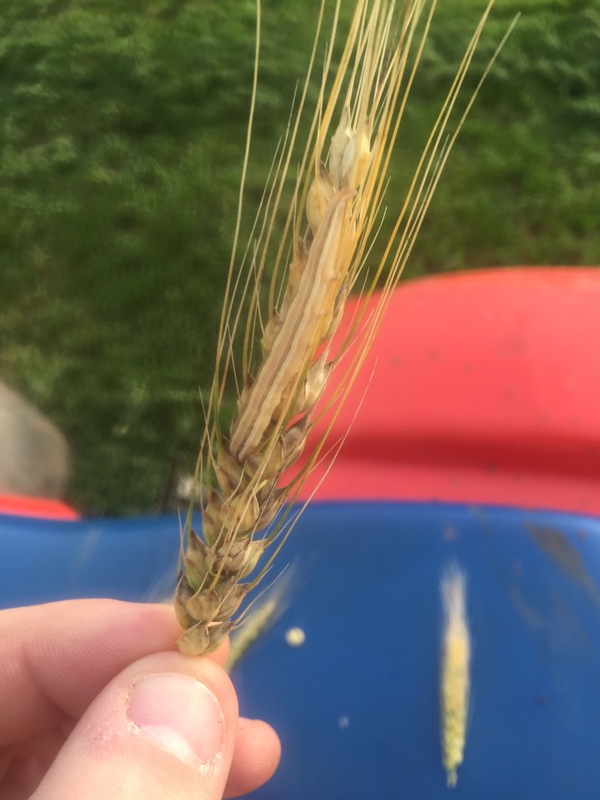 In addition to looking at wheat around Stillwater this past week, I also was at field meetings near Kingfisher (30 miles northwest of OKC), Kildare (10 miles north of Ponca City), and Lahoma (10 miles west of Enid). 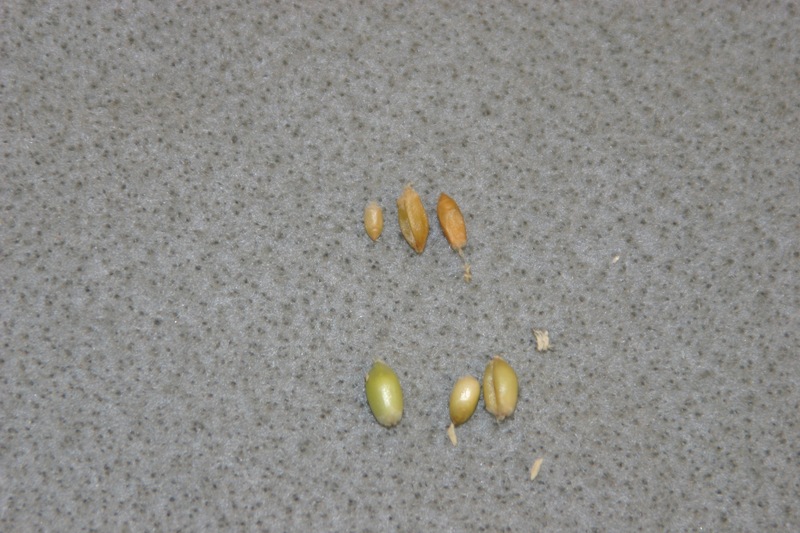 Wheat was at full berry to borderline milk. Stripe rust, leaf rust, and powdery mildew were present at all locations, with stripe rust by far the most prevalent. 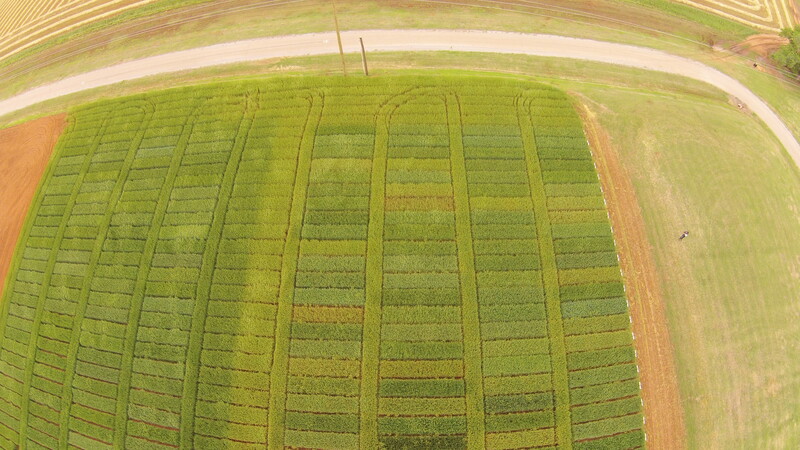 Where a fungicide had been sprayed (e.g., in Dr. Jeff Edwards variety trial), the effect was striking in terms of green leaf tissue. Difference in variety susceptibility to stripe rust was obvious, with Ruby Lee, Garrision, Pete, and Everest being some of the more common highly susceptible varieties. There also seems to be varieties with high levels of resistance (e.g., Gallagher, Jackpot, etc), and intermediate resistance; however, I’ll wait until I have all ratings in to evaluate this in more detail. 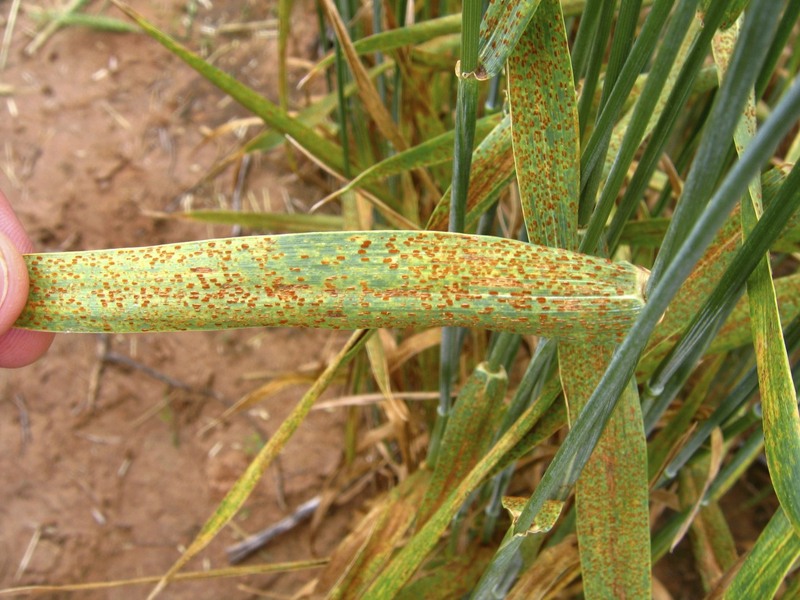 Leaf rust can be found in some varieties at severe levels, but has not increased to a level comparable to stripe rust. Most commonly, I am seeing it on leaves of varieties that are resistant to stripe rust, but susceptible to leaf rust (e.g., Jackpot). 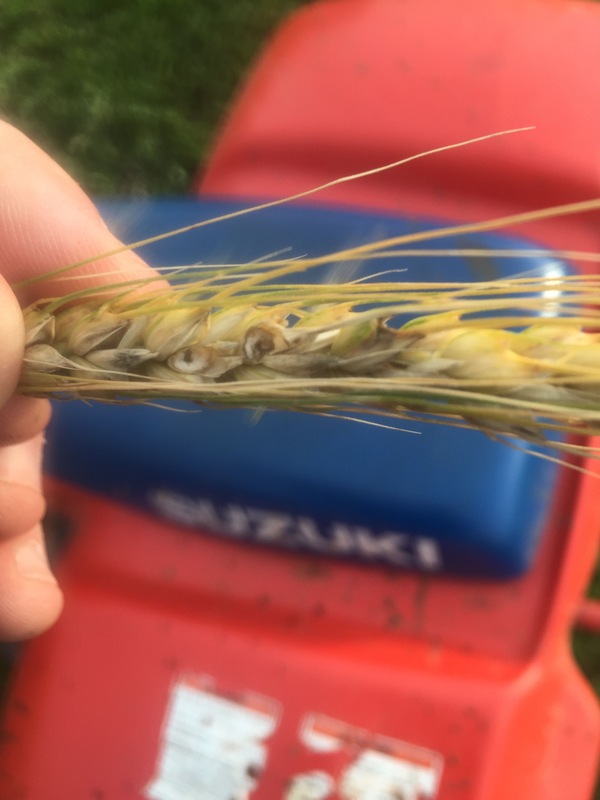 Barley yellow dwarf also was observed at all locations, but little to no stunting was associated with the BYD, so infection most likely occurred in the spring. Powdery mildew also was observed at every location, but only rarely was on the flag leaf or heads. 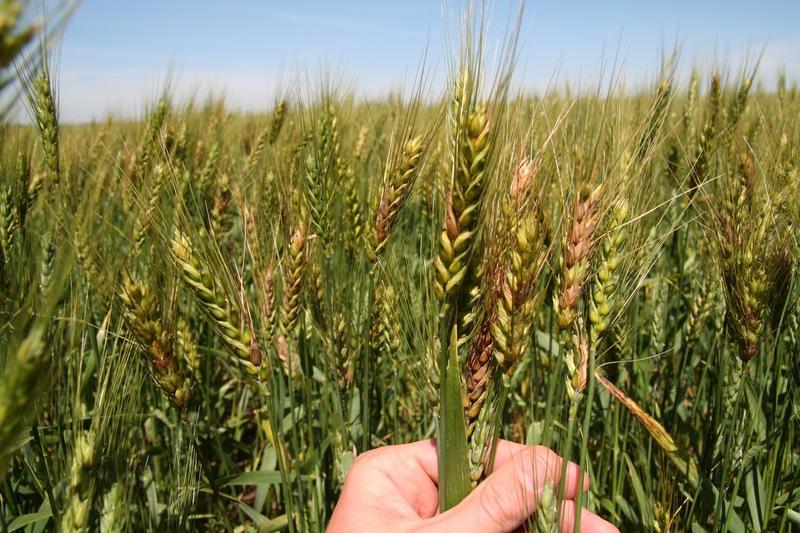 I have not seen any Fusarium head blight, but have had a few reports of it from eastern/northeastern OK.
Kansas: Dr. Erick De Wolf (Extension Plant Pathologist); Kansas State Univ, 4-May-2015: “The past week continued to bring more finds and reports of rust diseases in Kansas. Stripe rust is the primary concern many growers and the disease is now established in many areas of the state. 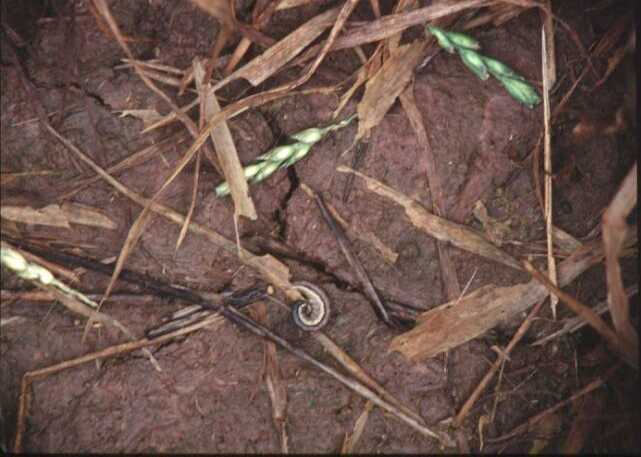 The disease has moved onto the upper leaves in many fields in the southeastern and south central regions of the state. 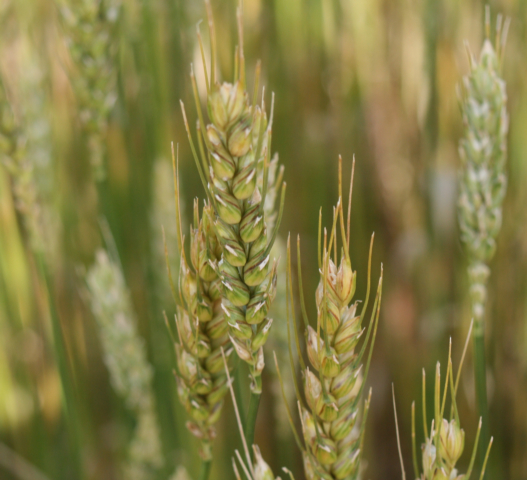 The wheat in these areas of the state was at or near the heading and flowering stages of growth this past week. 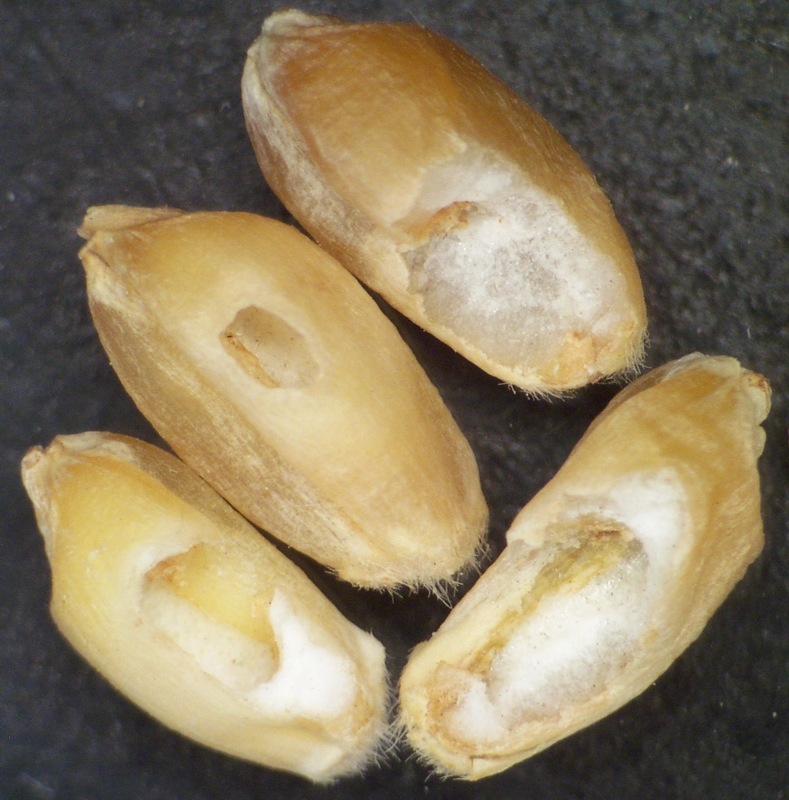 Infections on the upper leaves at these stages of growth places the crop at risk for severe yield losses. 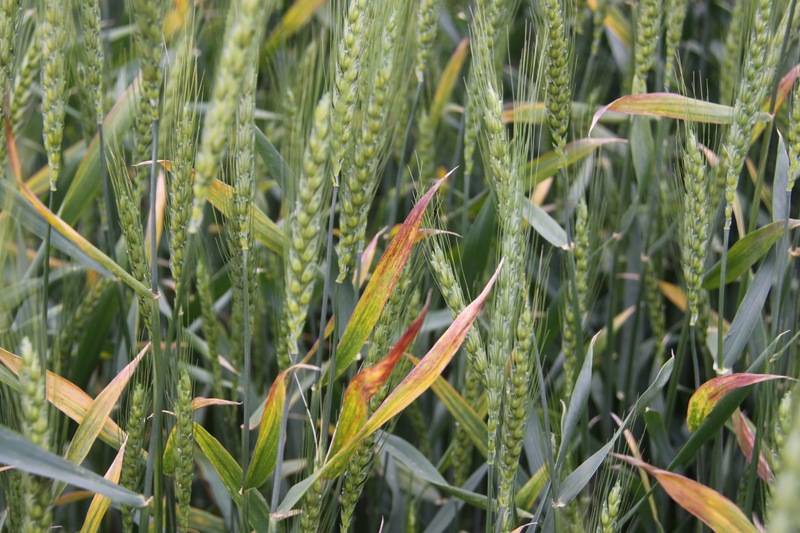 Stripe rust was found at low levels in many counties in the central and north central regions. 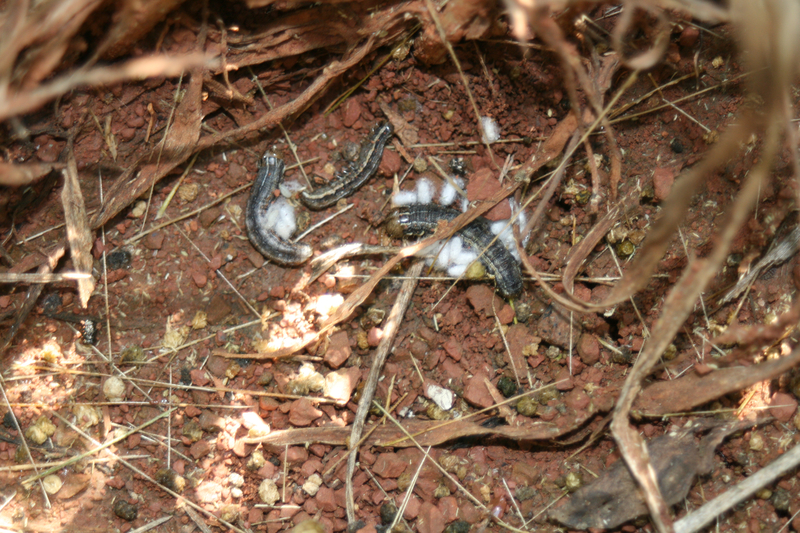 The disease was also reported at low levels in western Kansas. At this point the stripe rust was primarily low to moderate incidence (1-5%) and mostly restricted to the lower leaves of many fields in the central and western regions. However, the weather this past week was very conducive for stripe rust and the disease may soon increase to damaging levels in more areas. The risk of yield loss in these areas depends heavily on weather over the next 2 weeks. 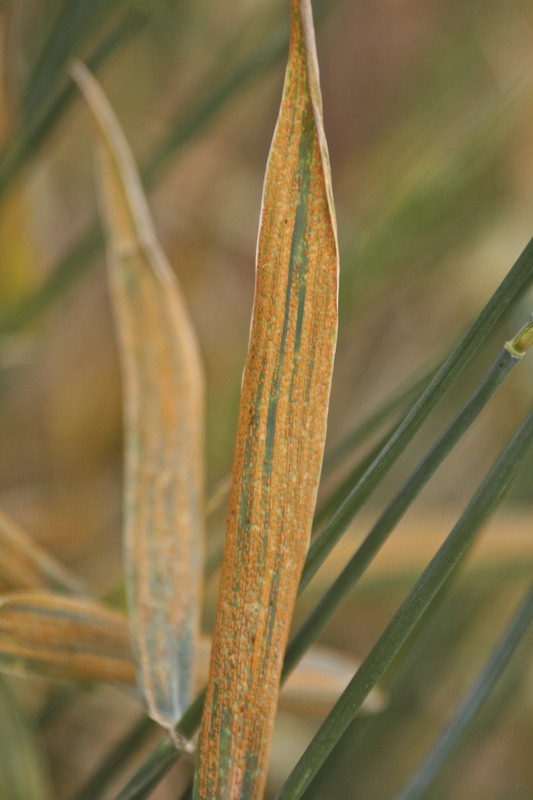 Stripe rust is favored by temperatures in the 40-60’s, frequent rain or heavy dew deposition. 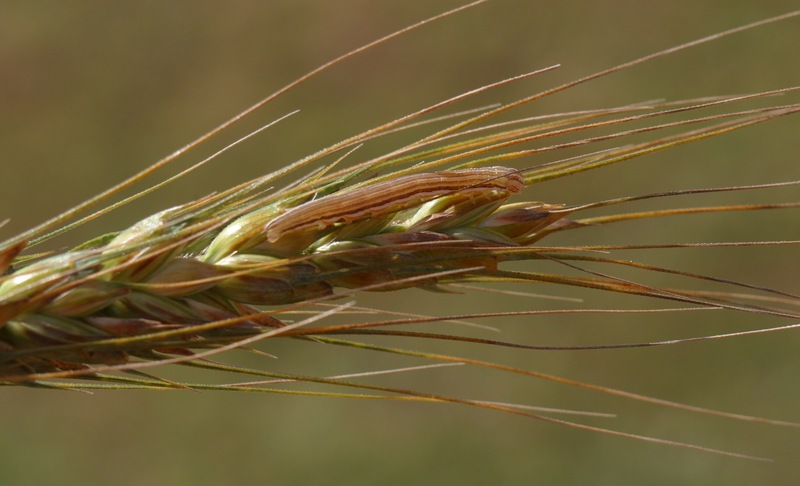 The progress of stripe rust often slows when nighttime temperatures exceed 60 degrees F. The weather outlook for the central region indicates that rain is likely this week but also suggests low temperatures may slow further disease development. 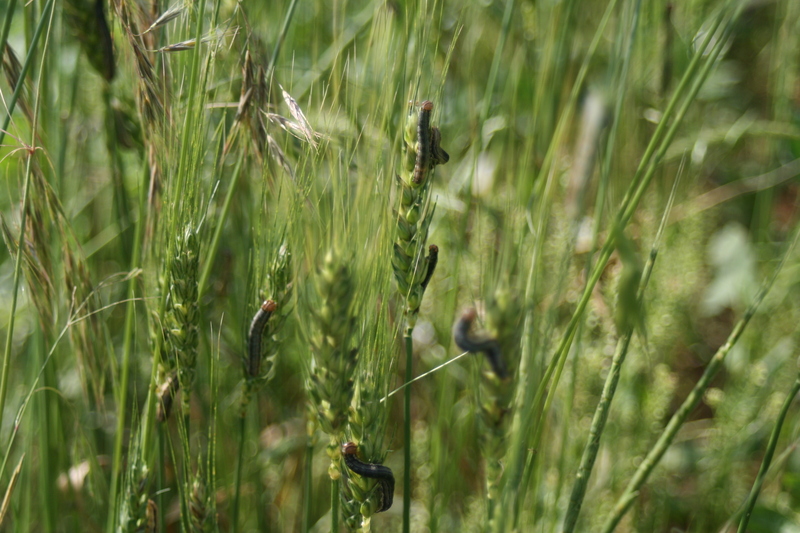 Temperatures in north central and western Kansas may be more conducive for stripe rust. So far the stripe rust is most severe on varieties known to be susceptible to the disease but there are some early indications of unusual disease reactions on varieties previously thought to be resistant. I will gather more information and come back with reports soon. Leaf rust has also been detected at trace or low levels at many of the same locations as stripe rust (Crawford, Clay, Ness, Riley, Saline, and Sumner counties). These reports are significant because the presence of leaf rust increases the risk of disease related yield loss in the state. 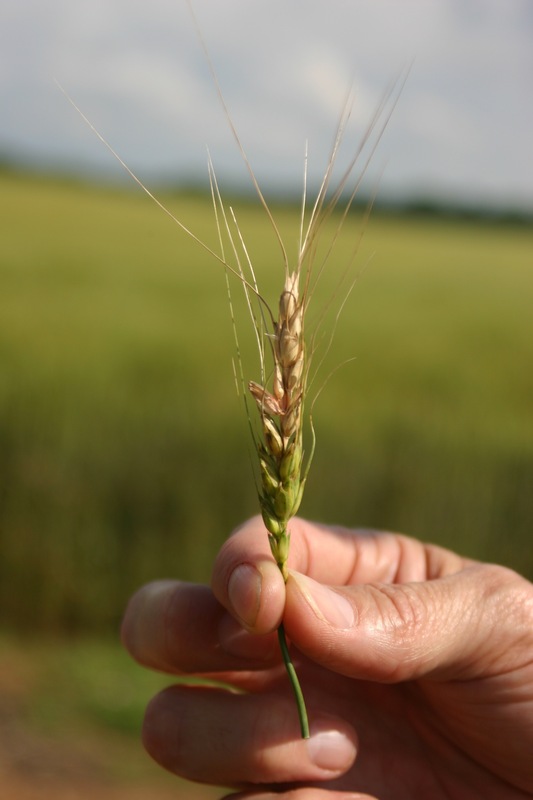 Many of the popular varieties grown in the state are susceptible to leaf rust and finding the disease prior to flowering indicates the leaf rust may also cause problems in some areas. 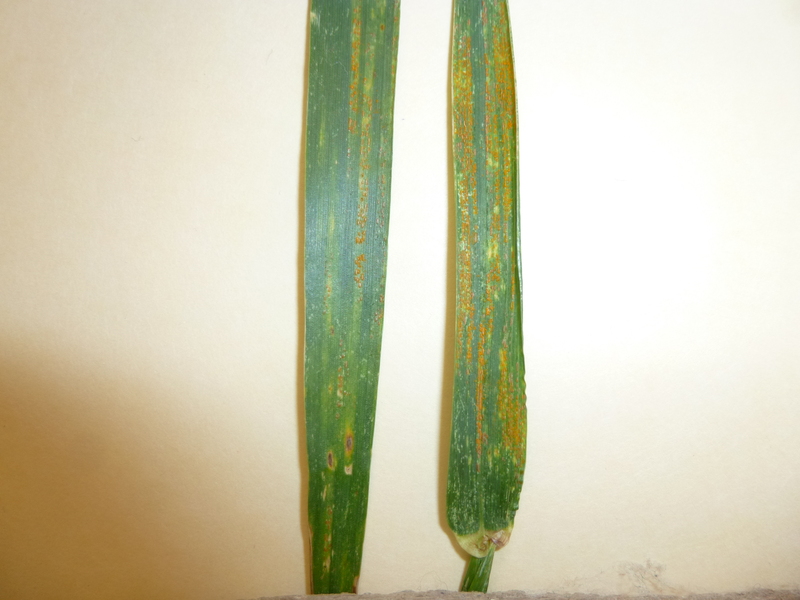 To date the leaf rust appears to be most common on varieties with the Lr39/41 resistance gene (Fuller and WB 4458 for example).